Some of my one-of-a-kind collector dolls inhabit an imaginary world known as The Ladies Tea & Garden Club. The members of this exclusive club meet weekly at The Rose Cottage Tea Room. Non-members may attend by special invitation only. Each week the ladies order dainty sandwiches, freshly baked scones with clotted cream and a very large pot of piping hot tea. Their discussions are wide-ranging, however, tempers flare whenever the topic of the latest Royal Family scandal arises and a lively debate ensues. But soon cooler heads prevail and another pot of tea is ordered. Following the meeting the ladies retire to the peaceful comfort of the sun room to take up their knitting or read a spellbinding gothic novel. Blanche taught school in New Orleans for many years, but was persuaded to retire as a result of her unorthodox teaching methods. Subsequently she moved in with her sister Stella and brother-in-law Stanley, but soon left after a bit of unpleasantness. Blanche then traveled to Key West, Florida to visit with her younger sister, Margo. Unfortunately for Blanche she arrived at the same time as Hurricane Hooligan and was whisked up the east coast. When she landed she was a bit bewildered to find herself in Nova Scotia. After wandering about and depending on the kindness of strangers, she finally arrived at Margo’s Place and was reunited with Margo. Blanche now lives a very quiet and secluded life, only venturing out to attend the weekly meeting of the Ladies Tea & Garden Club. She says she still feels “a bit bruised and blown about”. Her nerves are very weak and she often feels the need to bolster them with judicious swigs of “nerve tonic”. Blanche does not frequent Margo’s Place as it is too raucous for her delicate nerves. The ever enigmatic Edwina Honeycutt enjoys a good bit of juicy gossip with friends over a hot pot of tea. Each afternoon at The Rose Cottage Tea Room she orders cucumber sandwiches, raisin scones with clotted cream, macaroons, shortbread and assorted petit fours. Edwina Honeycutt always keeps pin money in her purse and a few secrets under her hat. She never speaks of the unpleasant episode of her disappearance for a fortnight some years ago. She was feared kidnapped, but instead was found in a resort hotel in Cornwall, where she had used the last name of her husband’s mistress. She claims to have no memory of what had happened, an amnesia she says brought on by stress. And that is all she ever has to say about it. After a life in domestic service, Mrs. Thing is now retired and enjoys spending time relaxing in her favourite wicker chair. Some afternoons she dons her fascinator and with work basket in hand, slowly meanders over to visit her friend Jennie. While drinking a nice hot cup of tea they knit, exchange patterns and have a long chat. When she arrives back home, Mrs. Thing often has a gentle foot rub to sooth her aching feet. I would like to introduce myself; I am Mrs. Thing’s new roommate. She loves sitting in the den with the warm sun pouring its healing rays over her sore feet, while she knits and discusses William and Kate’s latest misfortune with the press, I think she will be very happy in her new home even though I am not a knitter. 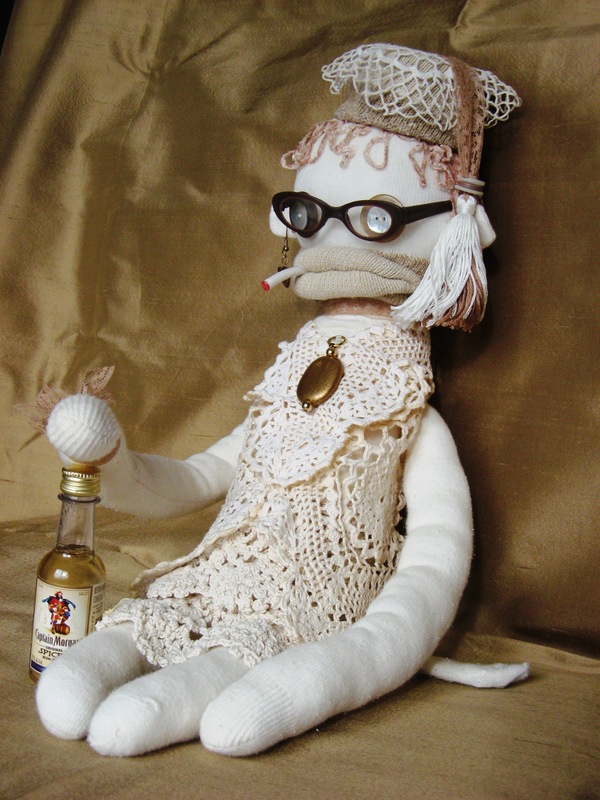 However, on weekends we do visit my sister in the Annapolis Valley, where Mrs. Thing spends many hours having tea with my sister, Jennie, and learning new knitting patterns. My sister is a very special lady, who first introduced me to Mrs. Thing. When they finish their tea and knitting, we all get to enjoy some of my favorite past time – shopping! Thank you Sandra & Jennie for my new friend, Mrs. Thing! – Rose F.
Hello Rose – I’m so glad that Mrs. Thing has found a good home and shopping companion! Don’t be surprised if you hear a few complaints about her sore feet while browsing for bargains at Frenchys. A good, strong cuppa will always put Things right. Mrs. Thing would like to send to you her special Christmas wish for a wonderful holiday, and a healthy and happy 2013. Mrs. Thing spent her day wrapping gifts while listening to Perry Como Christmas songs, and enjoying a lovely cup of Chai Latte. The moment I saw Mrs. Thing I knew my sister would be a great friend ! I enjoy hearing about Mrs. Thing and all the activities they do together, especially enjoying the many visitors and days at the cottage.